On a cold and stormy night, Shigeru Akagi crawled out of the ocean, stumbled into a dingy waterfront Mahjong parlor and into a rough Mahjong game. Nangu was in heavily in debt and had been offered a chance to gamble away his debts by the yakuza. If that did not work, they had made sure that his life insurance policy would more than cover what he owed them. That evening?s tiles had not been kind to Nangu and with nothing left to lose, he decided to take a chance and let the thirteen-year-old Akagi play in his place. The events of that evening are still quietly spoken about and of how a rank-beginner beat the yakuza rep (or professional) player. 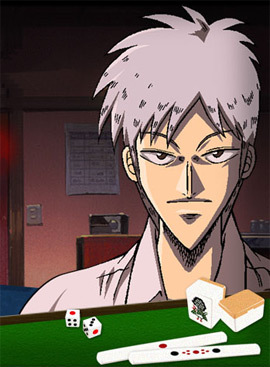 It was that night that the legend of Akagi - the genius or monster of the Mahjong game - was born. Based on the mahjong manga by Fukumoto Nobuyuki.